If you operate a food truck, think about installing a point of sale (POS) system, especially if your food truck business has a high-risk merchant account associated with it. A POS setup allows you to accept various forms of payment (such as credit and debit cards), track inventory, calculate sales tax, manage coupons, and discounts, and identify customer trends, consists of both hardware and software. Explore how food trucks can benefit from using POS systems, how to select one, and how to set up a POS system for your mobile food establishment. 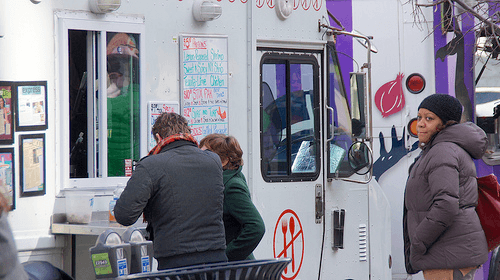 Why Do Food Trucks Need POS Systems? According to a report in Money Magazine, most people still use cash for purchases under $5, but that buying pattern is starting to change. Among Millennials, nearly 65 percent prefer plastic for small purchases. This fact alone should be enough to convince many food truck owners to install hardware and software that allows them to accept credit and debit cards. Most POS systems make engaging in a credit card transaction easy for you and your customers. In addition to accepting credit cards, many POS systems give you valuable insights. You’ll have access to data, such as menu items that are the most and least popular with your customers. This data can help you make better choices when ordering supplies and maintaining food inventory. Some POS systems track employee hours and calculate sales tax for all cities where you sell your food. Thanks to these and similar functions, a POS setup can save you headaches and prevent bookkeeping errors. Setting up a POS system requires you to have certain pieces of hardware. At a minimum, you’ll need a tablet or laptop that runs the POS software, a register with a secure cash drawer, and a device for swiping credit and debit cards. You may eventually decide to add other items, such as a receipt printer, desktop printer, display screen for customers, and a PIN pad. If you begin with the basics, you can always integrate other components after your business increases, as long as the new hardware is compatible with your system’s software. Make sure the hardware can physically withstand the food truck environment. Your equipment may be exposed to flecks of hot grease, steam, splashes, and spills. Spend a little more for protective cases or sturdy equipment that will last. You need versatile software that not only fulfills your current demands but also has the capabilities to meet your future needs. Select a package that, at a minimum, handles cash and credit card transactions, calculates sales tax, accepts multiple payments for a single purchase, and processes multiple orders simultaneously. Also, make sure the software can handle and store payments even when your device isn’t connected to Wi-Fi. While these elements represent the basic functions, you should buy software with broader capabilities, even if you aren’t ready to use all of them. Inventory management, invoice creation, customer reward program administration, employee time tracking, and gift card processing are a few of the advanced functions that you may want to have available to you in the future. Finally, make sure the software is intuitive. In the fast-paced environment of a food truck, you don’t want a complicated POS system that requires multiple complex steps to complete a transaction. After purchasing your POS system, you’ll need to make sure it operates smoothly. Select a traditional merchant services processor or one that can give you a high-risk merchant account to handle your credit card transactions. While you may be tempted to go with a mobile card reader, this device doesn’t offer the advanced functionalities that will help grow your business. Instead, go with a standard processor or a high-risk merchant account provider that works with payments obtained by your POS system. You’ll receive better service and protection than card-swiping devices that attach to your tablet or phone. If you have any questions about your system, take advantage of the POS provider’s customer service features. A phone call can help you avoid setting up the system incorrectly. While a variety of food industry POS systems are available, only a small number of them are specifically designed for food trucks. Choose a system that’s right for your business’s current needs and remains flexible enough to adapt as your food truck business needs evolve.